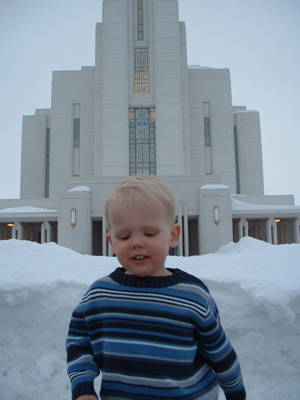 This picture of James was taken in February on the day of the temple open house. James has recently had an extreme obsession with the temple. He loves to just stare at pictures of the temple while I sing "I Love to See the Temple" to him over and over. Since the pictures of the temple are hanging on the wall, I have to hold him so he can see them good. At first he would just listen intently, and when I finally got tired of singing it after the fifth or so time, I would try to put him down. Then, he would proceed to throw a fit, and point while crying, "Tempo! Tempo song!" After listening to me sing it so many times, he now has it learned himself. We are still trying to get one line straight, however. Instead of singing, "For the temple is a house of God", he seems to think it should be, "For the temple is a house of dog." We'll have to keep working on that one. 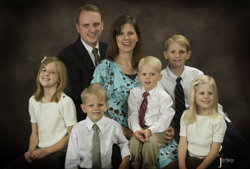 Here is a typical evening at the Ferguson Family home. If you currently do not have children, but are considering having them in the future, you may want to refrain from watching this.